The rise of Nicolás Maduro, Venezuela’s new president. 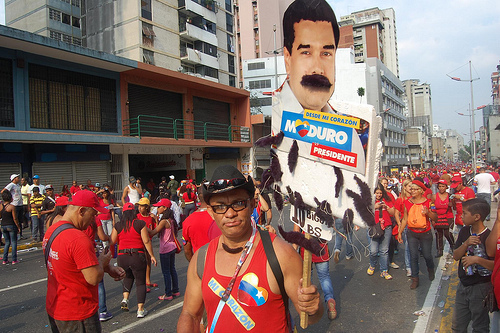 Nicolás Maduro supporters rally in Caracas in the run-up to the election that brought Maduro into office. Photo: LuisCarlos Díaz via Flickr. In January 2013, after having won a corrupt political campaign through opportunism, the use of State resources to improve his chances, and lies surrounding his health, Hugo Chávez was not sworn in to office, as is constitutional mandate. Instead he was in Havana, dying of cancer. In his absence, Nicolás Maduro, without having been elected and in the name of “administrative continuity,” governed the country, ordering drastic economic measures (such as currency devaluation) by means of fake signatures, appointing ministers, and signing checks. From his lonely watch post Albert Camus asked who among us has not experienced exile yet still managed to preserve a spark of fire in their soul. “We’re all alone,” Natalia Sedova cried in exile on hearing of her husband Leon Trotsky’s affair with Frida Kahlo. In his novel Night Watch, Stephen Koch follows the incestuous love affair of David and Harriet, wealthy siblings watching the world from their solitary exile. Koch’s writing, Camus’s theories, and Trotsky’s affair all come back to exile and lead me to reflect on the human condition. From my own vantage point, my Night Watch, I will reflect on my questions of exile, writing, and the human condition. Israel Centeno was born in 1958 in Caracas, Venezuela, and currently lives in Pittsburgh as a Writer-in-Residence with City of Asylum/Pittsburgh. He writes both novels and short stories, and also works as an editor and professor of literature. He has published nine books in Venezuela and three in Spain. With Hugo Chávez dead, Maduro, protected by an interpretation from a Supreme Court bent to his usurping will, violated Article 229 of the constitution and declared himself non-elected president, rather than standing down. Much like “his father” and predecessor, he turned, in an increasingly stupid and rude manner, to the muscles of the petro-state, as well as engaging in intimidation through blackmail, menace, and open threats in order to take on his opponent Henrique Capriles Radonski. Now Maduro has usurped power, riding on the bayonets of the armed forces and other institutions that are under his thumb. The result of the elections on April 14 sought to legitimize the scam that began when Hugo Chávez, in spite of his end-stage illness, put himself forward as a candidate in the October 7 elections. With a tiny margin and in the early hours of the morning on April 14, following a highly irregular day with armored vehicles lining the streets and menacing paramilitary units—the “revolutionary groups” roaming the streets on motorcycles and firing shots in the air—the National Electoral Council declared that Nicolás Maduro had won by a small number of votes. Straight away, Maduro, speaking from “the people’s balcony” of the presidential palace, launched into an overly triumphant and defensive address, full of clichés, figures of speech, and even more threats. It was the speech of a loser intent on justifying his madness. For fourteen years, institutions in Venezuela have been torn down and, in their place, scaffolding legitimizing the excesses and irregularities of the “process” has been erected. Today, this has been made clear to the world. Democracy is an exercise; Maduro is a de facto president rather than a legal one. Since he began his usurpation he has been using this motto: Revolution does not lose elections, much less surrender power. It seems as if the army made the decision; sadly, we must recognize that bayonets continue to be the deciding force in our region. Maduro is a man who has been molded in Chávez and Castro’s shadow and who has no limits. In particular, until now, he has not been considered a romantic figure, nor has he tried to shift paradigms; he is merely continuing a legacy and consolidating a model, borne along by serious issues that are to be interwoven with the geopolitical dynamic of Cuba, a country upon which we entirely depend. There will be more economic crises, more scarcities and shortages, more inefficiency. But these revolutions with real socialism at their core, what else have they brought us? Repression, intolerance, inefficiency, scarcity. Unlike Cuba, which has always had to seek financial backing, such as from the former Soviet Union, Venezuela has vast economic resources and reserves that, until now, have been able to buy worldwide legitimacy for a dictatorship enshrined in democracy and an electoral process designed to be rigged without any protest. There is a new term for this: Illiberal democracy. And as its choke-hold on Venezuela continues, our oil and gasoline, our strategic reserves, continue to be handed over promptly and zealously to all international capital interests.